I'm not into hockey either, but if you couldn't put it down, it must be good. I'm not a big fan of hockey either but I like reading and learning about things I don't know. That's great that this book held your interest. Well, I am a HUGE hockey fan. My grandson played for awhile and kids hockey can be pretty exciting. I will look for this one. It sounds great. Thanks for the post. This one went out the same day I put in on the shelves...hockey player! He is enjoying it so far. I am awaiting my turn to read it! Thanks for this review! 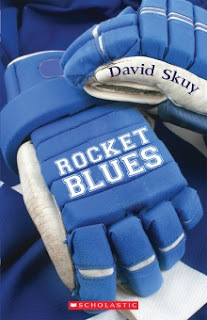 I'm always looking for books about hockey as so many kids are involved in the sport in my part of the world. Thanks for the recommend. I'll be sure to pass it along. My grandson lives to play hockey. What a great recommendation for him. I enjoyed the plot and the message that sports represents only a part of Rocket's entire life.